I was lucky enough to see this film on a Qantas flight from LA to Melbourne early in December. My expectation was a low budget, low brow, attempt at making a motorsport film. I was truly blown away by what I saw. Anthony Hopkins deserves an Academy Award for the understated performance of Bert Munro. Always polite, and always focused Bert's dream get embedded in your heart and becomes your dream as well. The journey becomes the story with the characters he meets along the way getting obsessed with his vision as well. The scenes at The Bonneville Salt Flats are stunning and picturesque. I was left with a smile I couldn't get off my face and a tear in my eye. A simple film with a simple premise becomes my "Best Of" pick for 2005. We very much enjoyed this film, even though we had to watch it on a small screen in a relatively obscure theater. The true story of a New Zealand hero is a classic and deserved a great film. Here we have it. With minimal pretension and just the right combination of drama and laugh-out loud comedic relief, this film entertains on every level. One can't help but fall in love with the legend that is Burt Munro, and be inspired by his legacy of tenacity and endurance. Although the story is of a New Zealander in the 1960s, the journey Munro takes is universal. His determination to live his dream is a theme everyone can understand. I thoroughly recommend this film to all ages and walks of life - there's something in this film for everyone. At times sentimental, occasionally straining credibility, this feel-good ode to determination and idiosyncracy, is a remarkable and entertaining drama. Bottom line: Slow, immersive, and also catch me if you can kind of belief, rather unusual and very engaging, inspirational at times with effortless performance from Antony Hopkins. Quite impressive it was. What it lacked? It lacked a fast screenplay. 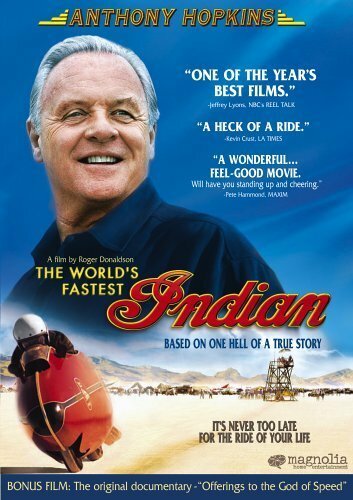 The world's fastest Indian is a bit dull for most of the film, but when it reaches it's great lines and high points it is brilliant. This film grabbed me from the start even by being very slow! I love The World's Fastest Indian, but throughout the film they could have had a bit more excitement to make it more fun. However, that wasn't the case, and I still love this film! Decent, but a bit too long and slow-paced for my taste. Great acting as always by Anthony Hopkins though. The movie is about a man from New Zealand who dreams of testing the speed of his Indian motorcycle at Bonneville. He is a man with a colorful personality, which adds to the charm of the movie. While there are indeed mature themes in the movie, I think it can be a great platform for addressing with children how social and cultural differences can be handled with a spirit of charity. Indeed, this is perhaps the most impressive aspect of the movie's portrayal of Burt Munro - his acceptance of everyone. Great lessons for kids who are at the proper maturity to observe it and discuss it. By the way, it's based on a true story. Just google "Burt Munro".